This beautiful winter wedding took place at the Banff Park Lodge in March. Charlene and Deepak were engaged in Banff so it was only fitting that they returned for one of the most important days in their lives. 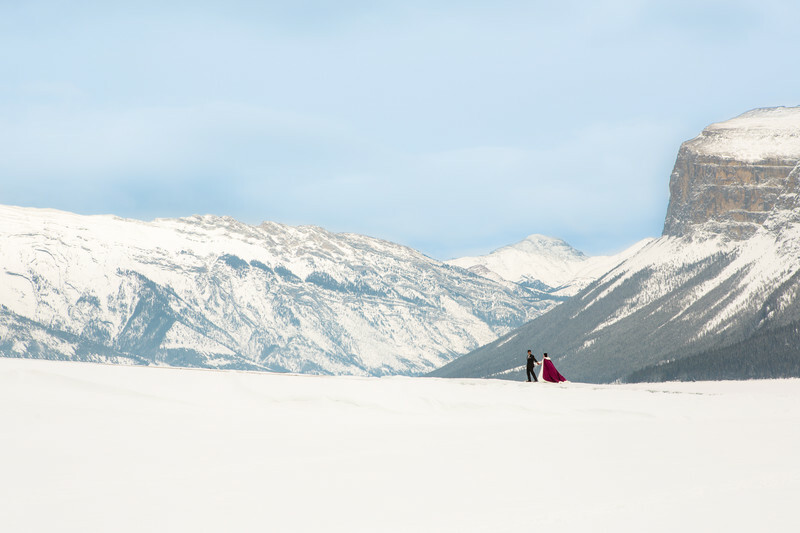 We chose Lake Minnewanka for their wedding portraits because we knew the ice would be frozen. What we didn't foresee was how much snow would be on the lake. Charlene was determined to walk in the deep snow to get this shot and we are so thankful she did. This is an image that every time I look at I say "wow". I think it's the enormoty of the mountains combined with the colours of the cloak. It just feels like something out of a fairy tale. We are so lucky to live near the rocky mountains. Location: Banff National Park, 222 Lynx St, Banff, AB T1L 1K5.